The fearsome "Carolina Butcher" isn't a legendary serial killer. It's a 9-foot-long ancestral crocodile that stomped about the southeastern U.S. during the Late Triassic, eating smaller armored reptiles and competing with dinosaurs for top-predator status. Oh, and it walked on its hind legs. Carnufex carolinensis, fondly nicknamed the Carolina Butcher, is clearly a badass addition to the family of proto-crocs that once roamed the Earth alongside the dinosaurs. It was discovered by paleontologists from North Carolina State University and North Carolina Museum of Natural Sciences, who recently dug up fragments of the beast's skull, spine and upper forelimb. 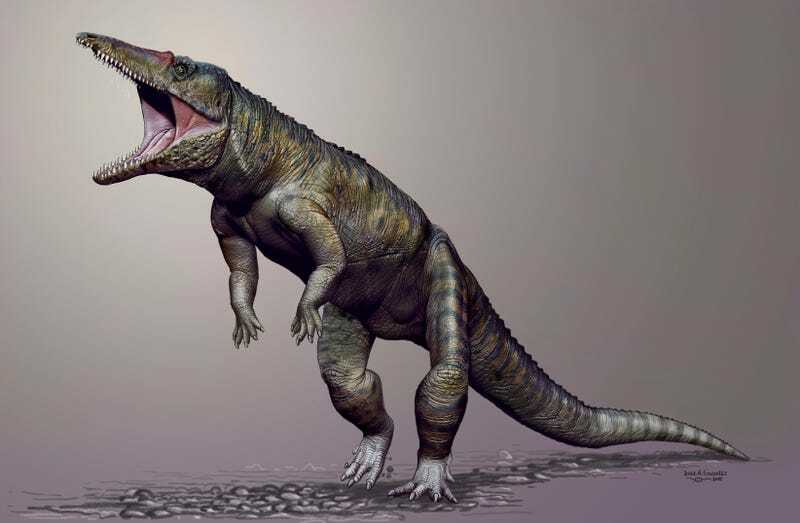 The discovery, along with a 3D rendering of the crocodylomorph's skull—filled in by comparison with close relatives—appears today in Nature Scientific Reports. When the Carolina Butcher was alive some 231 million years ago, North Carolina was a warm, wet, equatorial region, just beginning to break off from the ancient supercontinent Pangea. Fossils from this time period are extremely important to scientists because they record the earliest appearance of crocodylomorphs and theropod dinosaurs, two groups that first evolved in the Triassic period, yet managed to survive to the present day in the form of crocodiles and birds. The discovery of Carnufex, one of the world's earliest and largest crocodylomorphs, adds new information to the push and pull of top terrestrial predators across Pangea. Other fearsome crocodylomorphs, including rauisuchids and poposauroids, roamed southern Pangea during the Late Triassic, competing with early theropod dinos to ascend to the top of the food chain. Now we know that crocs were gunning for the throne in the Northern Hemisphere, as well. Zanno describes the situation as a "predator pile-up," where a panoply of reptilian beasts competed to fill an single top-dog slot in their ecosystem. Ecosystems can only support a limited number of top predators, and as fate would have it, the dinos won out. Like many other once-great predators, the glory days of the Carolina Butcher ended in extinction. In fact, only small-bodied crocodylomorphs and theropods managed to pull through the End Triassic extinction into the Jurassic. "Theropods were ready understudies for vacant top predator niches when large-bodied crocs and their relatives bowed out," says Zanno. "Predatory dinosaurs went on to fill these roles exclusively for the next 135 million years." Fleeting as their reign was, it's awesome to imagine a world where towering crocodiles clomped around on two legs and rivaled dinosaurs. It's also nice to know there are still plenty of unexpected monsters to dig out of the ground. Top image: Life reconstruction of Carnufex carolinensis. Copyright Jorge Gonzalez. For awesome predators and more, follow Maddie Stone on Twitter.